Pumpkin Chocolate Chip Cookies – Shelle H.
My freshman year of college I had a roommate named Shelle. 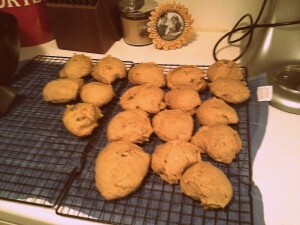 She was an amazing baker and loved to make pumpkin chocolate chip cookies. I of course, loved to eat them. Baking was a de-stresser for Shelle so we definitely were surrounded by goodies during finals. I was lucky enough to get a copy of Shelle’s pumpkin cookies before moving out and had the pleasure of making them last month. They were soft, gooey and delicious. You really can’t pass up this opportunity to try them yourself. Pumpkin Chocolate Chip Cookies – By Shelle H.
Preheat oven to 350 degrees farenheit. Combine pumpkin, sugar, oil and egg. In a separate bowl stir flour, baking powder, cinnamon & salt. Disolve baking soda in the milk and stir into the flour mixture. Then add to pumpkin mixture and stir well. 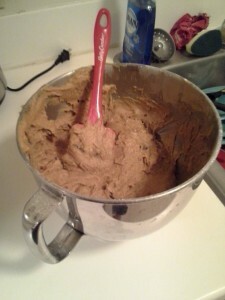 Add vanilla, chocolate chips and nuts. Drop by spoonfuls onto cookie sheet. Bake for 10 minutes or till lightly brown and firm.